Day 6 of the Heapnose perfume diary. Today I’m wearing Pomegranate Noir by Jo Malone. There’s lots of reasons to like Pomegranate Noir: The main reason being that this award winning fragrance forced me to learn how to spell Pomegranate…I’ve been foxed by that one for a while now, and I don’t mind saying that Microsoft spell checker completely hung me out to try. 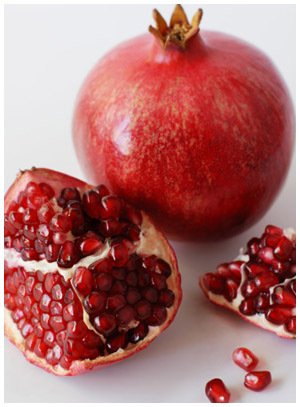 I almost stopped eating pomegranates because of it. Sunday Times readers might have celebrated when the damned things were hailed as the new superfood, but for this nervous blogger, they represented vast fruity fetters on my (largely) uncensored prose . For years I’ve been terrified to write about my penchant for pomegranate juice: I’ve been pretending that I start my day with a glass of orange, sometimes apple, but never that damned cursed pomegranate. Now though, I feel as though I can write it about as freely as I would the humble pear, and it’s a cause for celebration here at Heapnose Towers. Most Jo Malone fragrances have a bit of a “Ronseal” policy – ie they do exactly what they say on the tin. The Grapefruit Cologne is great if you want to smell like a grapefruit, ditto the Red Roses Cologne, but Pom Noir is a tad more complicated, and features lots of plum, frankincense and spicy woods (see diagram right). Perfect for the cold weather. Ms Malone is also famous for creating fragrances which blend well with one another to create a new and unique scent. So you could for example lighten this Pom Noir by layering it with Nectarine Blossom and Honey, or by using it in conjunction with the Orange Blossom body butter. Alternatively you could do neither and use the money you save to buy a car, put your kids through college or travel around the world. Twice. No, Jo does not come cheap, nor is she one to jump on the oh-so-trite January sales bandwagon. 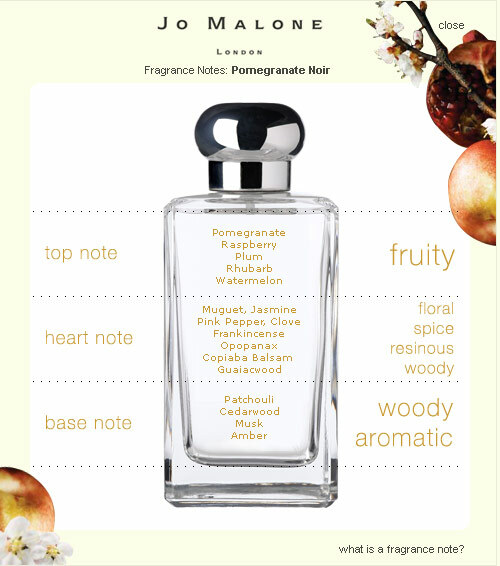 I’ve often found her fruity fragrances a bit fruity (see Ronseal policy, above) and her florals a bit pissy, but Pomegranate Noir is well worth the investment, and, in fact, only gets better as the day wears on. It’s that perfect blend of classic contemporary, modern but discreet, warm but not overwhelming. I love it. announced Sion the Amiable Translator, in a flash of inspiration as I breezed past this morning. The man is a genius. Pomegranate Noir is in fact the first perfume that my (then) housemate and (now) boyfriend ever bought me. I’m not prone to sentiment on this blog – but since this will likely be my last post before Valentine’s day, I hope you’ll indulge me just this once. Actually it’s not a terribly romantic tale…He bought me the perfume on a Thursday and we were an item by the following Saturday. The formula was simple but effective. I recall my (then) boss and (now) good mate Ife remarking, the morning after the giving of the gift that “ [your] housemate will be wanting more than a cooked breakfast from you my girl.” How right she was. 18 months and 2 immigration applications later, we’re pretty grand actually. Hook, line….and I love you. I mislead you… My sincere apologies, it wasn’t Pomegranate Noir that I liked, it was Blue Agava & Cacao that I shall be investing in soon.